In the absence of any blockbuster news—but plenty of speculation—stocks continued their ascent at the outset of the new quarter, with the S&P 500 (SPX) climbing to within 1.7% of a new all-time record. No one’s signed on the dotted line yet, but Chinese Vice Premier Liu He noted that the two countries had “reached new consensus,”1 and unlike similar episodes in the past, this time there was no rebuttal (as of Friday, anyway) disavowing the progress. It appeared to be enough to keep a bid under stock prices during a mostly quiet week, and when Friday’s job report topped estimates—the US economy added 196,000 new jobs, and unemployment held steady at 3.8%—it may have alleviated some of the fear triggered by the previous month’s anemic job growth. Sector action: The top-performing S&P 500 sectors last week were materials (+4.5%), financials (+3.3%), and consumer discretionary (+3.2%). The worst-performing sectors were consumer staples (-1%), utilities (-0.2%), and health care (+0.3%). On the downside, media analytics company Comscore (SCOR) fell -30% on Monday after the company’s CEO and president both unexpectedly resigned,2 while medical device maker LivaNova (LIVN) shed -28% on Friday after releasing disappointing preliminary Q1 sales numbers. Futures watch: On Friday, May WTI crude oil (CLK9) closed above $63/barrel for the first time since November 5. June gold (GCM9) retreated to support around its January and March lows (around $1,285/ounce) on Thursday, but reversed intraday to close higher and then follow through with another small gain on Friday to climb back to $1,296. Show me a country without any large, successful companies, and I will show you an unsuccessful country—with too few jobs and not enough opportunity as an outcome. Following the S&P trend. Say what you want about stocks not pausing to take a breath after a record Q1, by one measurement, at least, the stock market is arguably right around where it “should” be. 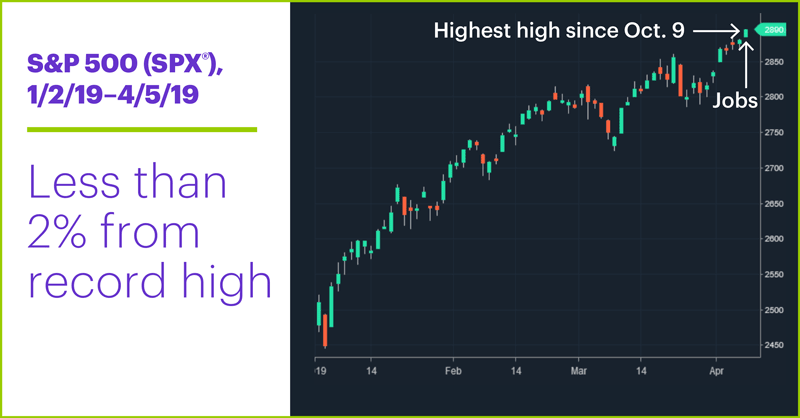 That’s because when the SPX closed at a new 107-day high of 2822.48 on March 15 (when it broke out above its October–December 2018 trading range highs), it was the first time it had made a high of that magnitude since September 20, 2018 (121 days). After the 25 other times since 1960 that the SPX has made a new 107-day high after that long of a drought, its median gain 15 trading days later was 2.1%. 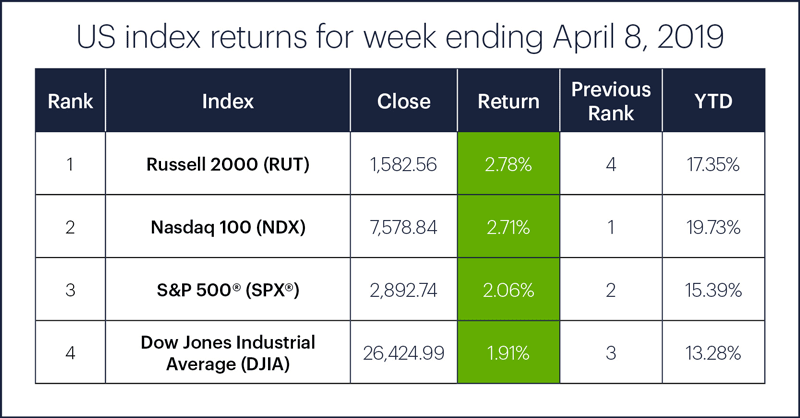 As it turns out, Friday was 15 trading days after March 15, and the SPX ended the day 2.5% above the March 15 closing price—pretty much right in the ballpark of the typical historical return after similar breakouts. Also, the SPX's 15-day, 2.1% median return after the breakouts was nearly three times the 0.72% median return for all 15-day periods since April 1958, which suggests the index has often had some extra bullish momentum for at least a few weeks after this type of long-term breakout. 1 Bloomberg. Kudlow Sees No Letup in China Talks as Both Sides Cite Progress. 4/4/19. 2 MarketWatch. Scientific Games sub SciPlay files for IPO on Nasdaq. 4/5/19. 3 Crain’s Chicago Business. Two execs abruptly quit Comscore. 4/1/19. 4 JPMorgan Chase & Co. Annual Report 2018: Chairman & CEO Letter to Shareholders. 4/4/19. 5 Supporting document available upon request.